It was Saturday, May 16th, 2015, when seven novices made first profession in our chapel, in the presence of Abbot Dionys OSB, of the Ndanda Abbey. The name of the newly profess sisters are; Sr. Winfrida (Nov. Winfrida), Sr. Christiana (novice Edina), Sr.Adili (novice Adili), Sr. Katharina (novice Katharina), Sr. Paskalina (novice Paskalina), Sr. John Paula (novice Maria Goreth) and Sr. Magdalena (novice Magdalena). 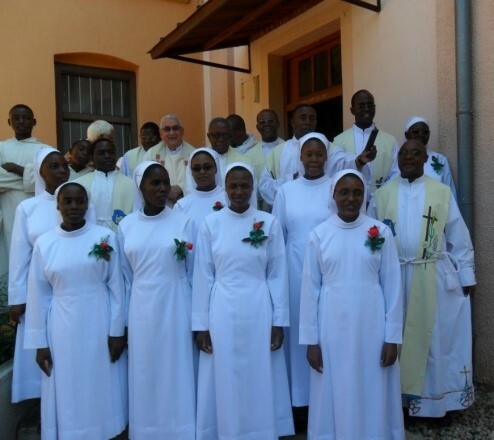 We thank the Lord for his guidance from the first day when we stepped into Missionary Benedictine Sisters of Tutzing, Ndanda priory till today. We are very grateful to our priory and the whole congregation for accepting us as members. Let us pray for each other so that we may remain faithful to our promises.